Shivering the Smartphone industry with it’s two recently launched high priced Smartphones in the gadget industry known as as Sony Xperia Z and Sony Xperia ZL. Both these Smartphones gained popularity with an amazing dust and water resistant feature. And now to continue the same feature in it’s most prodigious and popular ranges of Smartphones, Sony has dipped a new element Sony Xperia ZR in the Indian market. Sony Xperia ZR was one of the most speculated device in recent weeks and now finally company has officially announced it to halt all all rumours. Coming to its technical details, in terms of display, Sony Xperia ZR comes with a decent 4.6-inch HD Reality LCD touch screen display with 1280 x 720 of pixel resolution. As compared to Sony Xperia Z which has been offered with 5 inch of screen this device is little smaller however difference of less than half inch is not a big difference either. It will also help to attract those buyers who were reluctant to adopt 5″ Xperia Z because of its huge screen size, they may now find 4.6″ Xperia XR comfortable enough to be used as a mobile device. Sony Xperia ZR comes with a new display technology named ‘OptiContrast’ panel which removes the gap between the screen and the touch sensor by integrating the sensor on the main panel itself. 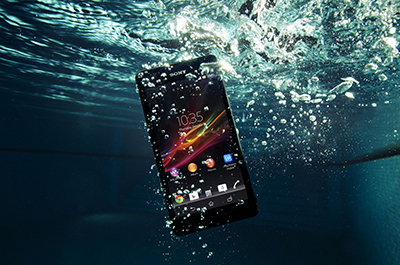 From the launch of Sony Xperia Z and ZL, there were several complaints of its water resistance feature not working as expected and failing, company has this time beefed up water resistance ability of Xperia ZR, it can now tolerate up to 1.5 meter water pressure for 30 minutes. Dealing with it’s Platform dependency, this device sails on Android 4.1 Jelly Bean Operating System powered with a Qualcomm Quad Core processor at a clock speed of 1.5GHz. In terms of Body dimensions and measurements, Sony Xperia ZR weighs 138 gms and measures 131,3 x 67.3 x 10.5 mm approximately. Enumerating the device Photography Specifications, as per the information available from sources, this device has been offered with the same camera unit as we have seen in Sony Xperia Z and Xperia ZL. It supports a primary camera rated at 13MEGAPIXEL with 4128×3096 pixels resolutions, it also supports Exmor R lens rear camera that ensures brilliant shooting and 1080p video recording. On it’s front, it supports a secondary camera rated at 2.2 MEGAPIXEL for video chatting. Some of the other features of camera includes Geo-tagging, touch focus, face detection, image stabilization, HDR, sweep panorama and many more. Enumerating it’s Storage specifications, the phone will come with an internal memory of 8 GB which can be easily expanded up to 32 GB using a MicroSD card slot up to 32 GB. It is also equipped with a 2 GB of RAM. The phone comes with regular connectivity options like 3G, NFC, USB port, Bluetooth, Wi-Fi, GPRS, EDGE, etc. There is no information regarding it’s pricing, availability and power capacity. For more information, Stay tuned with us.